Creatine is a substance that is developed naturally within the body, stemming from various food sources including beef. When you are working out or taking on a body building routine or resistance training, replenishing your creatine will help to boost your energy reserves. If you become low on your creatine phosphate stores in the body, you could end up having to cut your workout short. 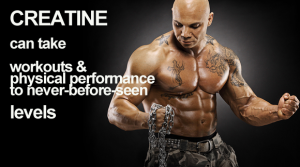 This is why many body builders will make sure that they have all that they need in terms of a quality creatine supplement so that they are able to perform to the level that they desire and truly get results. To put it simply, creatine works to help retain water inside your muscles. Whenever your muscles are holding in water, they are in prime mode for being able to build new muscle. If you are going to be weight training, you will be able to have much more of a result when you are taking creatine supplements because your muscles have everything that they need to perform. Most people who take a quality creatine supplement will tell you that they have been able to increase both their endurance as well as their strength during training while having extra creatine on board. Even if you are taking in a meat eating style diet, you will still be able to get added benefits from packing on creatine supplements as you work towards your body building goals. The liver and kidneys inside your body always produce small levels of creatine and then once you eat meat, you will be gaining more in terms of natural creatine. A quality creatine supplement is great for helping you to go the extra mile above and beyond the natural creatine that your body is able to produce. For some people, simply eating meat, particular game which is a great source, just is not enough to get the results that they desire. The creatine that you take in will become available to all of your major skeletal muscles, including the triceps, biceps, pectoral muscles and more. Creatine will work to participate in the contraction process of the complex muscles, thus helping to really maximize your muscle energy. Creatine will also work to fuel the development of ATP, or adenosine triphosphate, which is a quality fuel for your muscles. Normal levels of ATP in the body will only allow you to go through a few seconds of energy at high intensity at a time before becoming burnt out. While looking for the best creatine supplements for body building, you are going to find that it is important to do your research. There are many different companies out there that are putting out these supplements and you will want to make sure that you are able to get the most for the money that you are spending. Look at the different brands to see which are rated the highest from consumers and you are going to have a better chance of achieving the results that you are looking for. Do Creatine Supplements Enhance Recovery? Is Creatine Good For You? Is Creatine Bad For You? What Does Creatine Do For You?